...there were kids who swore it wasn't for the game, but for a real movie coming out. (Ah jerkface kids.) The game cost TWO goddamn quarters, lasted about 30 seconds and provided nearly zero directions. We ate it up of course. I came across an arcade version a few years back at the amazing Funspot in Laconia, New Hampshire. So I subjected my friends, some familiar with the game, some not so much, to the beast. The result were...less than stellar. When the game was released in 1983 the video game industry was collapsing under its own weight. The market was over-saturated with rushed games, cheap clones and poor manufacturing. 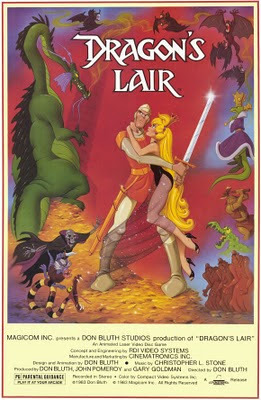 'Dragon's Lair' stood out from everything else of the time, and even given its gimmicky qualities was way ahead of its time. The game play paved the way for the now all too common Quick Time Events that are present in modern games. 'Heavy Rain' is obviously the lovechild of Dirk and Daphne. If only the original played as well!!! I never played any of the other iterations of "Dragon's Lair," but it seemed like it became something of a rule that they all had to be notoriously difficult. The Angry Video Game Nerd did a little look back at the game and specifically spends time with the NES version. The original arcade version is the one that has really stood the test of time. Currently you can get it for the iPhone/iPad from the App Store. Most recently it was released for download on the PS3. It's on their PSN for $10 and it's a full 1080P HD version. A thing of beauty...and torment. Don Bluth is actually returning to video games with "Tapper World Tour." Sadly it doesn't look too hot. Tapper is andother classic game I played quite a bit. Glad to see an update but yes, it's less than amazing from such a talented artist. I must have spent at least,$75,000,000,000 worth of quarters in the same Charles E. Cheese.